Before you read any further, please note that this post is a repost from Model Mayhem. I am NOT the author of this post – I am simply sharing valuable information that I personally have found useful and would like to share it with my fellow photographers and in doing so, hopefully boost the exposure of this article. Part II will attempt to cover some of the unique problems encountered when using window light, as well as explaining some techniques for artistic expression. These are somewhat related, but both need to be understood to create evenly lit images. Typically this unevenness is caused by the fact that light generally enters through a window from above (from the sky), so quite often the subject’s lower body receives more light (as well as more direct light). The end result is that the subject’s face tends to be darker, but also will have less contrast, than their arms and midriff (in a 3/4 shot). Another approach is to fix this in post production. This is one of the advantages of modern digital photography. In the above example, a line has been drawn showing where the selection was drawn for this purpose. On this 12mpx original, a feather value of 250px was used to feather the effect. The important part is learning to recognize this condition and working from that knowledge. This image really demonstrates the typical shift caused by the difference in color temperature between the sky (very cold) and the surrounding earth and buildings (usually much warmer). With this diagram I hope to show that windows act like lenses: they invert the image projected through them. Anyone who has used a view camera will remember that the image on the ground glass is inverted. 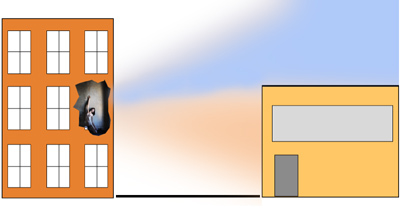 What this means is that the cold blue light from the sky is projected toward the bottom of the frame while the warmer light reflected from the building across the street is projected up, toward the top of the frame. Normally I would have drawn a selection from approx 2/3 of the way to the top on the right margin diagonally down roughly through Melissa’s left breast then almost to the bottom of the frame on the left. After feathering this selection with a setting of around 150px, the “Variations,” “Brightness and Contrast,” “Hue and Saturation” and perhaps other PS controls would have been used to “even up” the colors and contrasts. As mentioned, I found the shift so striking that I decided to use this image just as it came from the camera. The term “Special Effects” might be overstating things a bit, but in this last section I would like to suggest some methods of modifying the feel of an image by using available light and exposure to control contrast. Backlighting can be very effective in creating a dreamy feel. A wide aperture setting allows more opportunity for light to “bounce around” in the lens. This softens the image by creating diffusion. A relatively high EV setting will also contribute to this high key effect. Once again, digital cameras provide some advantages. These scenes are quite difficult to meter accurately when using film. The image preview feature of modern cameras allows us to effectively do clip tests while shooting: I set the preview to show highlight clipping and allow the background to become blown out while maintaining detail in the important bits (model’s face and skin tones). Another backlit shot. The one above was in a rather light colored room and the source was a large patio door. This gave us an “awash with light” situation. This one of Samantha was shot in a relatively dark and very large room, so there isn’t nearly as much light being reflected back from the room itself. Also, by carefully positioning Samantha between the windows, a nice rim lighting was achieved. The next two photos give an idea of how strong an effect lens flare can have on contrast. We were shooting in an old factory. I was seated across the room from Tiana. The sun had gone a bit to the West, and so I was actually sitting in the sunlight coming through the high bank of windows camera left. I asked Tiana to hold each pose for two clicks. I used my hand as a lens shade for one, and let the sun fall into the lens on the next. In some shots the lens flare was nothing short of spectacular. This image was shot in exactly the same light conditions as the one above (eleven frames later) but this is one of the ones in which I protected the lens from direct sunlight. As mentioned above, a light colored room with lots of windows can provide relatively high levels of softness by diffusing the light. This is basically a two source image as described in part one. The room is white and small, with lots of windows, so deep shadows exist almost nowhere, giving an angelic appearance. A slightly different approach to “awash with light”: This room has windows on three of the four walls. It combines backlight with fill from both sides, as well as some reflected off the fourth wall behind the camera position. Footnote for Model Mayhem: My current shooting preferences call for as little equipment as possible—usually one camera body and one lens. This is not for any reasons of purism, or even a need to avoid artificial light. This preference has evolved for me mainly for one reason: The fewer distractions, the better. Over the years I have realized that (for me at least) there is an inverse relationship between the amount of equipment involved and the level of communication with models. Sometimes we see photographers in the forums here on Model Mayhem asking about and striving for “style.” Often the tools one uses combines with the artistic outlook of the photographer to become that person’s style. For me this is analogous to what constitutes a model’s style: The way their body moves; the ways in which they choose to emote and use body language. If we let these things happen they will IMHO be much more organic than attempting to forcibly produce a style.